The word “nomad” is not new, it has traditionally meant a member of a tribe who roamed from place to place in search of animals and shelter, having no permanent abode, therefore it was coined way before the Internet era and even before modern civilization. But today, we call nomads to individuals who work remotely and have no permanent residence, people who mostly travel the world while working online with their laptop. There is an important difference from the ancient nomads and modern ones. Digital nomads are not driven by necessity, fleeing from hunger or chasing the promise of another countries. Conversely, digital nomads are motivated by freedom and an inner urge for exploration and discovery. With a minimal lifestyle, they value experiences, memories and their own time more than before. Also, they seek for a new ways to see the world and learn from other cultures. 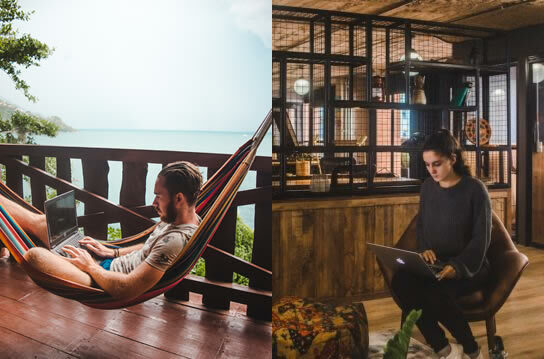 Nowadays, millions of people around the globe are looking for transitioning to this kind of the digital nomad lifestyle. Tired of their 9-to-5 office jobs, bored of traditional way of living, people not only young but from ages are creating their own lives, sometimes away from society standards, but much more fulfilling. In this article, I want to share 4 inspiring stories from amazing souls who are in this process or are already making a living online and traveling the world making their dreams come true. My transition to digital nomading was pretty slow and drawn out. As an engineer I started working from home and found that I much preferred working on my own, out of the florescent lights and close-neighbors of an office. I kept thinking it was really silly that I had to waste time commuting and taking everything I’d need for a day at the office to the office where I could be more productive at home anyway. I had decided around this time that what I really wanted was to be able to work remotely and travel. About a year after finally getting to work from home, figuring out those challenges and getting pretty good at it, my engineering job phased out and I started dedicating most of my time to building my own business. This time in Web Design and Photography, two things I was already being paid to do in my free time. It was a struggle for the first few years as I discovered all there is to know and more about owning a business and how much time it takes. I learned many, many lessons; some the hard way. But after about 5 years, I absolutely would choose this path over working in an office for someone else. My life became vastly more ‘my own’. I could make my schedule, make plans to travel and manage my day more effectively for everything from eating better, fitting in yoga and workouts and even seeing and spending time with family and friends. I decided to take it one step further and not be restricted by a lease and roommates, moving every year or so and saving up for plane tickets. I bought a small RV and spent this past summer rebuilding it as my home and office on the road. Now I travel from place to place, visiting clients, making new contacts and expanding my networks. I can spend some time in each place and get to know the character and opportunities. I can slow things down or speed them up at will and it keeps me from getting bored or complacent with a routine that’s fixed in one location. It has boosted my inspiration and confidence and made me realize how much I really wanted and needed a lifestyle like this to thrive. It wasn’t easy. It did and still takes an incredible amount of work to keep the business going, finish the RV renovations, stay fit, eat well, etc. I don’t think it necessarily takes any MORE work than maintaining a similar level of happiness, travel and health while being in one place, but I enjoy this lifestyle far more. It’s always about accountability and time management. I need to balance work with play but make sure I’m not avoiding or procrastinating. I write down the things I KNOW will make things better and I think about how good it will feel to do it now. 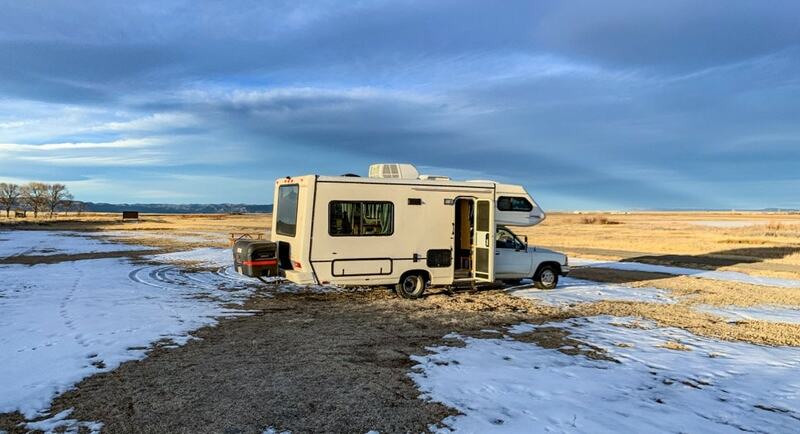 That’s how I ended up a digital nomad, with a small RV I rebuilt myself and with a business and lifestyle I love. We are Lauren Squire & Andy Quarmby, two British strategic brand consultants turned digital nomads who have been travelling Latin America since October 2017. We began our careers at a reputable Brand Consultancy near London, and it was only after we had solidified plans to quit our jobs to travel for 6 months that we entertained the idea of freelancing when our old employer needed extra help. Because of the project-based nature of consultancy, it can be very difficult to predict resource needs in the long-term, and so freelance networks fit well into this industry. We also maintain a travel blog called “Cuppa To Copa Travels” which has details on all the destinations we have been to, as well as general tips in order to help other travellers and digital nomads shape their own plans – and with any luck inspire a few to take the (admittedly terrifying) plunge to leave their enjoyable, stable careers behind. When we left to travel, we felt it was one of our last chances to do so, with no dependents and being at a well-established point in our career without being consumed by it. However, since being in the road we’ve met so many inspirational people of all ages and from all walks of life who have found a way to make this life change work for them, too. Up until Christmas last year, we spent 14 months travelling mostly by land from Uruguay to Guatemala. We began doing just bits and pieces of work as they came in with travelling our main focus, however, since we discovered this could become our lifestyle for beyond just a six month trip, we have been trying harder and harder to build our business and reach a point where we earn at the same rate (or better) than we are spending. Towards the end of last year, this became a reality as we recouped the majority of what we’d spent travelling up to that point and set ourselves up nicely for the future. We’ve been able to return to South America after Christmas, and we’re planning to spend this year mixing stability and semi-permanence, with time to travel and explore new places. We chose to settle in Colombia for its milder climates, happy people and endless adventures. It’s also a bit of a hub for digital nomads, so it’s easy to find a co-working space or decent coffee shop to work in. What we love is that if we have nothing on for a week or two we are able to pick up and leave pretty quickly to do some travelling – Bogotá and Medellín are both great cities for us to work in, with plenty of towns nearby to get to know. In Colombia, it is also incredibly cheap to book internal flights, meaning we have the flexibility at short notice to get away to somewhere else – deciding just a few days before to hit the coast and Caribbean islands of Colombia with some friends who were visiting made for one of our best weekends of the year. Perhaps the biggest challenge for us has been finding the balance between wanting to explore and needing to earn. We tend to slow travel anyway, but there have been times when we’ve booked X number of days in a new town, but then a project comes in on day 1 and we end up not getting the chance to explore any of the place we’ve travelled to before having to move on. Still, it’s a small price to pay for being able to live our dream, and it gives us an excuse to go back to those towns! In certain parts of Latin America, finding strong WiFi can be difficult. If we know we have a large piece of work coming up, we plan to be in a big city for those weeks or months. It’s staying for these longer periods of time that allowed us to truly fall in love with Bogotá and Antigua Guatemala, for example. Life is different now in almost every way to that of 18 months ago. We don’t have to wake up early and commute every morning, but we also don’t get to wake up safe in the knowledge that we’ll earn money that day. We are our own bosses, but we also miss out on the office camaraderie. We get to experience exciting cultures, new foods and the most beautiful of views, but sometimes we crave snuggling up on the sofa with family and a cup of tea. However, we do this knowing that we are able to return home when we want, or re-locate to somewhere far closer to home without any particular ties limiting us from doing so. It’s a move we’ve yet to regret! horrible and I felt right from the beginning (actually, on my first day at the job) that this lifestyle is not for me. I wanted to do something meaningful, to create something… not to sit behind a desk and answer phone calls from angry users. On that first day, 10th of June 2014 I decided: I will work as a freelancer 5 years from now on. And I started working on that beside my job – I had to pay the bills after all. I started to study something completely different from my degree: graphic and web design. The urge to create was always in me and I always loved to draw and to doodle on basically everything, so it seemed like a perfect fit – and it was! Then arrived the summer of 2018, when I just couldn’t stand the office job anymore. I had some freelance projects at that time already and I decided to be brave and I quit my day job. It didn’t really go as planned though. First, I’ve been thinking about a day job as a graphic designer, to learn, because I still counted as a junior designer. I sent my applications to around 30 places in one week – got 3 sample work opportunities and 2 interviews. No offers. I was shocked and panicked. Everyone said to just cancel my resignation and stay at the company – my manager even offered me a promotion! But that just wasn’t my way. I decided to go for freelancing and never again sell my time for a steady paycheck. I quit on August 18, 2018 and never looked back. I am now building my own business as a freelance graphic and web designer and I am finally location independent, which was always my dream. I decide my own work hours, I don’t have to go outside in the cold winter mornings (which is a huge plus! ), don’t have to waste 3 hours of my day for commuting and more importantly, I can create and work together with inspiring people who want to create something too. This is the best feeling ever! Currently, my homebase is in Budapest and this year, my goal is to travel more in Hungary and discover more of it – so many beautiful and inspiring places I’ve never been to! I attached some very important pictures. The one with the mug is when my idea of freedom was kinda finalizing. 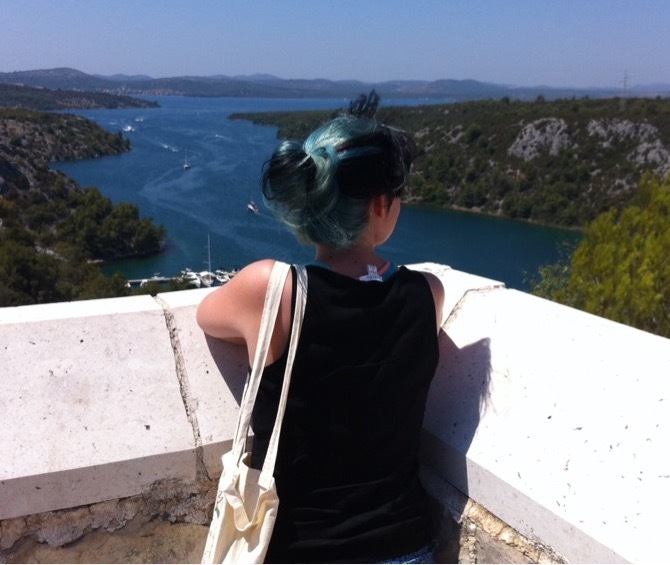 I sat on the terrace of our apartment in Kaštela, Croatia, when I was thinking about working and life itself. I was between jobs at that time but not ready yet to go straight for my dream. But the idea was born. The second one is also in Croatia – an important moment of my working process, perfectly captured. My biggest inspiration is nature – the crystal water, the clear blue sky – the colors of freedom. 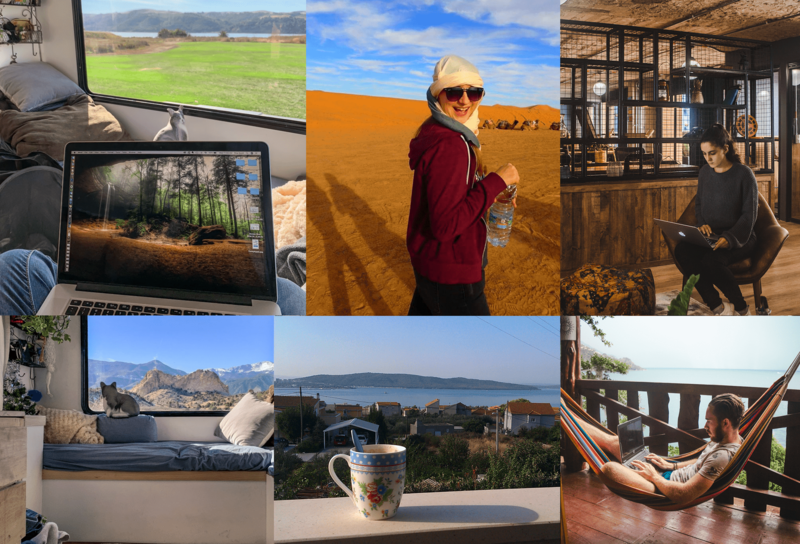 My name is Sophie, and I started working as a digital nomad in April 2017. But actually, my story starts a little while before that. NYE 2016 my main resolution for 2017 was to stop letting a lack of travel partners hold me back from following my dreams. I wanted to travel, but my friends all either didn’t have the time, money or just didn’t want to go. So, even though it scared me, I started traveling solo. I began by taking a few short weekend trips within Europe, then longer trips until I felt I was ready to take the next step and go backpacking on my own. I was also feeling unsatisfied with the way my life was going. I liked my job, but I didn’t love it. I had been living in the same city for seven years, and I felt like I just kept doing the same thing with the same people. In short, I was stuck in a rut, and I didn’t know what I wanted to do with my life — a classic quarter-life crisis. My contract in a marketing and communication position ended in October, so I decided that was the perfect opportunity to go out and really travel for a while and figure some things out along the way. 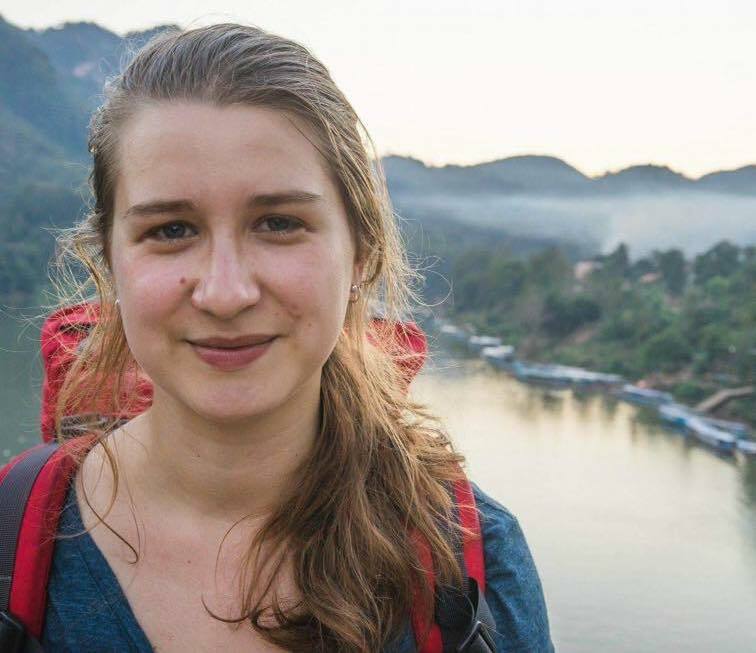 I started by backpacking through Ireland and Scotland for two months and then flew to Thailand to backpack in South East Asia for another two months. During those trips, I was the happiest I had ever been. Instead of predictable, life was suddenly exciting again and filled with new adventures every day. I loved every minute of it. I was dreading having to go home, back to the 9 to 5 and the rainy Dutch weather. And I still had no idea what I would want to do career-wise. During those two trips, I met several people who were working remotely as freelancers, something I had never thought of doing. But their stories made me realise that if they could do it, then so could I. I already had experience in translating, content writing and marketing from my previous jobs and studies. I had a travel blog that I started in 2017 to document my trips, so I decided to take a bit more serious and add a professional Instagram account as well. The more I thought about it, talked about it and read about it, the more excited I became. 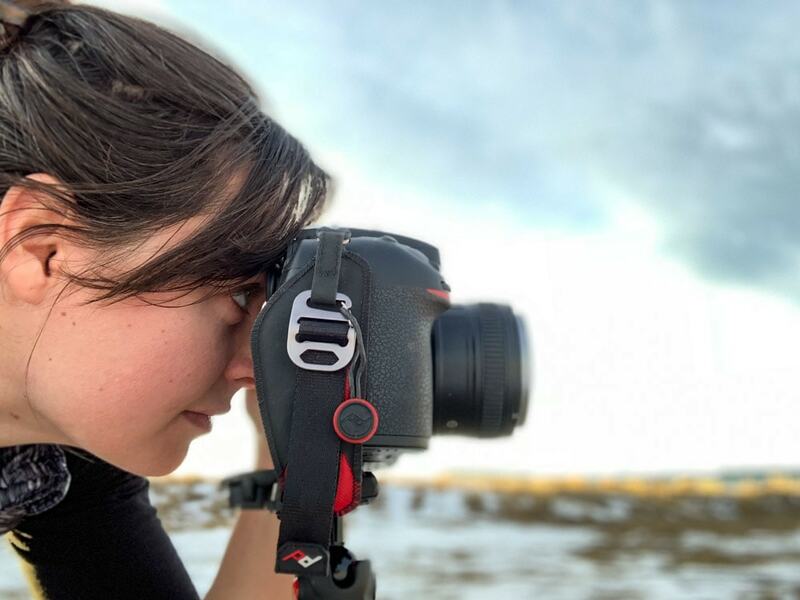 Being a digital nomad wasn’t just some faraway dream for Instagram influencers and YouTube vloggers, but something that I could actually do myself. I liked writing, blogging and translating. It’s something I had experience in and was reasonably good at and the perfect job to do remotely. So when I came back to the Netherlands in April, I dove into the details of starting a freelance career. I built a website, spruced up my LinkedIn profile, signed up do job boards, registered my company with the Dutch government and learned about VAT and income taxes. Starting my own business was surprisingly easy. All it took was an online application, 50 euro and a 5-minute consultation. I was out the door with a handshake and my papers. Finding work turned out to be a bit trickier. Luckily one of my former colleagues needed some help, so she hired me for my first job. As a freelancer herself, she was also able to give me really good advice about the administrative and practical side of things, such as how to price my services. Job boards like Upwork and Fiverr got me my next few gigs. I wasn’t making much, but living with my mom, I also didn’t need much. For me, it was more about building up a portfolio and references. The next step was to try working remotely and combine work and travel. I wanted to start small, so I planned a three month trip to Austria, Italy and Slovenia. I immediately realised that working from home is very different from working remotely. It is hard enough motivating yourself to work as a freelancer at home, but it is even harder when you’re in a beautiful new country with lots to see and do, surrounded by people on vacation. But on the other hand, I knew that if I didn’t work, I’d soon run out of money. The fear of going broke has always been a good motivator for me. I started planning my days a bit better and changed the way I traveled. Instead of moving every two days, I stayed a bit longer. I tried to work at least half the day and leave the other half for sightseeing or switch between the two from day to day. I also worked on trains and buses, pretty much whenever I had some time to kill. It was hard, but I got into a rythm that worked well and gave the confidence to continue. The next step is going to be a trip to South East Asia and working remotely from there. People ask me where I see this going, and my answer is always the same: I want to do this for as long as I can and as long as it’s fun. It’s not an easy life, but it allows me to follow my heart wherever on the earth it leads me. I would say that the hardest thing about working freelance, not just remotely, is the variable workflow. I love the flexibility of setting my own hours, but it can be hard to do last-minute jobs when you are traveling. And you never know if your week is going to be busy or not. Of course, I prefer long-term gigs that I know need something done every day/week/month, not just because of the steady income, but also because it’s easier to manage time-wise. But at the moment, I don’t have enough of those to sustain myself, so I still have to take small and incidental gigs whenever I can, which means that my week or day can suddenly become a lot busier, and I’ll have to change my travel plans to accommodate that. Or my week can suddenly free up due to a lack of jobs, which means more travel time, but also less income. I started my company in April and recently looked at my overall income and worked hours since then to see how I was doing and how much my perceived growth actually was. Basically, to see if this experiment was panning out if I’d be broke in a few months. As it turns out, I made around 2500 euro in the eight months since I started working as a freelancer. I know, pretty meagre. But I also only had worked 380 hours, including hours spent on my website, networking and pitching. Far under Dutch minimum wage, but still, could be worse. I also saw that my quarterly income had almost doubled each quarter. So, while I’m still not a point where I am comfortably supporting myself, I am definitely making promising progress. My goal for this year is to increase my work hours to 25 a week and my income to at least a 1000 euros a month. And then we’ll see where it goes from there. Either way, I’m excited by the prospect of the adventures yet to come.